Testament to Life (Two Volume Set). Photographs by Erika Diettes. Text by Anne Tucker, and Erika Diettes, and Ileana Diéguez. George F Thompson Publishing, Staunton, USA, 2016. In English and Spanish. 248 pp., 126 color and 20 black-and-white illustrations, 8¼x11½". Two volume set housed in a slipcase. Memento Mori: Testament to Life is a poignant tribute to the victims of Colombia's armed conflict that has claimed more than 250,000 people during the last fifty years. The book is presented as four bodies of photographic work in a two-volume, bi-lingual edition: English and Spanish. The first volume includes hauntingly beautiful images of Diettes's photographic work on display at museums and at memorials in areas where the victims “disappeared,” a moving statement by the artist herself, an essay by Mexican scholar Ileana Diéguez, and an extensive conversation with the artist by Anne Wilkes Tucker, former Curator of Photography at the Museum of Fine Arts, Houston. 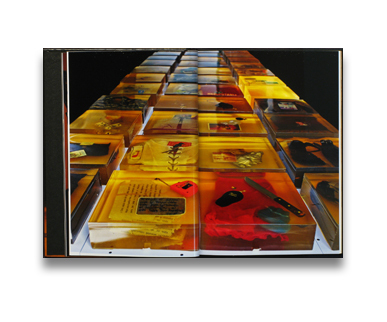 The second volume showcases the plates from three photographic series: Sudarios (Shrouds), photographs printed on linen of women who have witnessed atrocities committed against their loved ones, Río Abajo (Drifting Away), images of articles of clothing of “the disappeared,” photographed in water and embedded in glass, and Relicarios (Reliquaries), three-dimensional works of polymer containing mementos and personal effects of the victims. At once majestic, accessible, and deeply moving, this book makes a significant contribution not only to documentary art, contemporary Latin American studies, and social anthropology but also to those wanting to understand, at a very basic level, the human cost of terrorism. 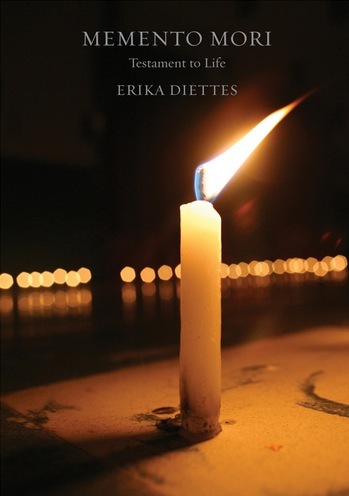 As Anne Wilkes Tucker writes, Erika Diettes's unforgettable book speaks “of universal loss from violent death.” And it is through her art that we learn how to grieve from such loss.